We’ve got our work cut out today, but I hope you’ll enjoy it. 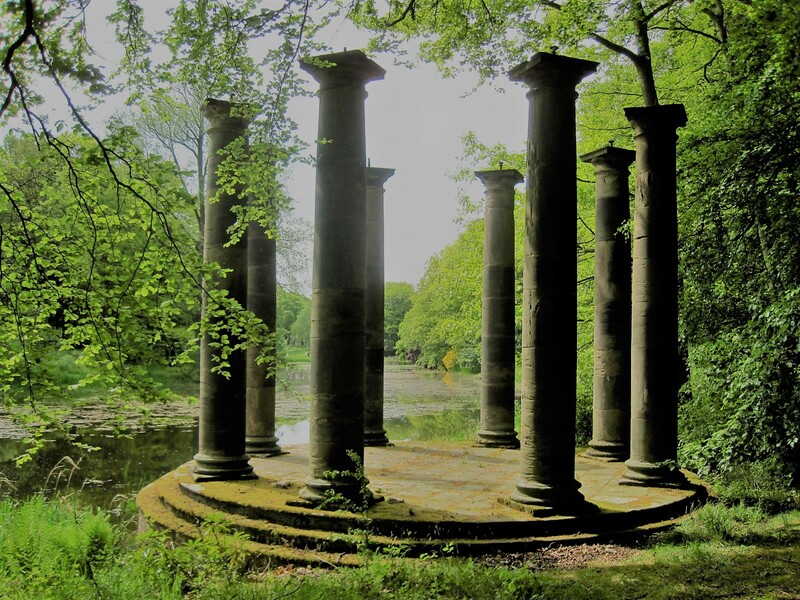 We’re off to see a Northumberland garden with an Edwin Lutyens touch, but first I need to take you back in time. It’s a warm, muggy day, totally unlike my last visit here when the biting winds cut through me and hailstones peppered my umbrella. I was meeting a lovely lady, a poet and a craft worker whom I’d many times chatted to on the blog. Though living in Brittany, Viv had a daughter in Northumberland and had suggested we might meet on one of her visits home. Her choice of venue was Northumberlandia, at that time newly opened to the public. In a particularly bitter March it wasn’t an inviting place, but the company was great and we valiantly struggled up the domes. I wrote about that encounter with a smile on my face, little knowing that we’d never meet again. In July 2016, Viv died suddenly, and my thoughts were full of her when I returned, to a much sunnier Northumberlandia, last week. I hadn’t planned to visit, but the garden I had come to see belonged to the Blagdon Estate, who donated the land for this project. The Ridley family have owned the estate since the 17th century, and Northumberlandia is in part an attempt to give back to the community some of the profits made through Shotton Surface Mine. The story of the landscaping is a fascinating one, but now I’m going to leave the lady sleeping quietly and turn my attention to the magnificent gardens, just across the road. You know you are amongst the landed gentry when the drive sweeps past a private cricket pavilion, with perfectly manicured lawn. In the distance, russet coloured cows graze, the house sheltered from prying eyes by a stand of ancient trees. Something entirely magical was about to happen. Strolling beside the beech hedges which run the length of Lutyens’ canal, a rustling suggested a presence beyond the hedge. Imagining the gardener not quite finished his chores in time for this Open Gardens event, I barely had time to register what was happening when out from the undergrowth burst a deer, in full flight mode. With a graceful leap, he was beyond the canal and disappearing again into the woods. I stood transfixed. Nothing to do but continue into the formal garden, but I found it hard to concentrate. My eyes were trained on the woods beyond, watching for movement. Finally the walled garden distracted me. Hard to ignore a couple of the beauties there. But the fun was just beginning. Behind a row of cottages, the Dene tumbles down to a stream. Wild garlic carpets the banks and, following the tangled path through the undergrowth, your reward might just be a jewel burst or two of colour. The path continues beneath the bridge, rounds a corner and there before you is a stately old viaduct. A lovely fragrance surrounded me and I stopped to admire the vivid yellow blooms. A gentleman asks do I know what they are and, with reasonable confidence, I declare them to be azaleas. A lady disagrees, assuring us that these American rhododendrons are the only ones to have fragrance? Jude is my expert. Through a gate designed to keep out rabbits, the quarry lies in wait. A sign declares that 6000 tons of stone were excavated in the 18th and 19th centuries to construct buildings on the estate. I love the way it has been turned over to nature, with just the odd quirk or two. 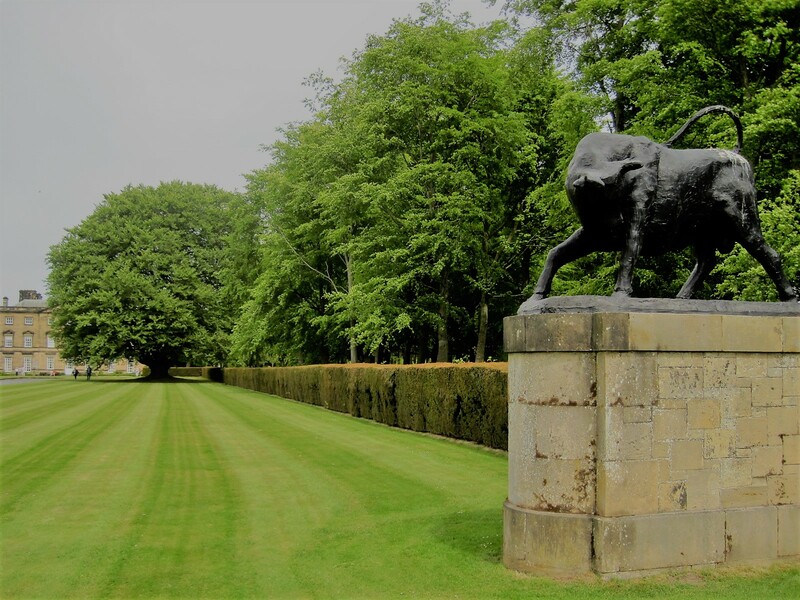 The gardens were extensively remodelled in the 1930s by Sir Edwin Lutyens, whose daughter Ursula was married to Matthew White Ridley, the 3rd Viscount Ridley. Some have stood the test of time, while other areas are a little unkempt. It must be an enormous task, taming a 27 acre estate such as this. One more treat in store, before we retire for that hard-earned cuppa in The Clockhouse . A figure of eight walk takes you around the lake and across the stepping stones. A chapel folly peeps through the trees, and in the distance a Grade II listed temple. I hope you’ve enjoyed our walk this week, and I’m sorry if it was a little lengthy . There are some extraordinary photos of Northumberlandia you might like on the Blagdon Estate website. No walk from me for the next 2 weeks, because I shall be in Poland and then visiting my daughter in Nottingham. I’ll try and keep up with you where I can. Meantime I have lots of lovely walks for you to browse. Many thanks to you all! I was followed recently by Tamar at Hike O Therapy. Doesn’t ‘a Cornish gardener hiking through Northern Spain’ sound interesting? Take a look! Surprises on the way home…. Enjoy your last day of the Bank Holiday if you’re in the UK, and to all of you, enjoy your walks! Take care till the next time.